The end of analog video has come – and gone, a long, long time ago. In fact, we are now full well into the digital age, so it makes perfect sense for the plethora of devices out there to play nice with the digital format as well. 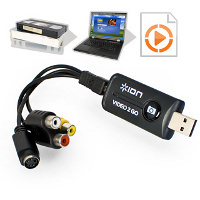 Video 2 Go is another prime example, where this £39.99 purchase will plug straight into your computer’s USB port, letting its software do all the hard work for you. Wait a minute here, you say. I’m a little lost. Let us back up a bit – all you need to do is attach this converter to your video recorder or video cam, connect it via USB to your computer and it will automatically let its software chop and crop converted videos on your computer, providing you with the option to burn them to DVD, or even upload them to the Internet as well as download favorite clips to your portable media player. Video 2 Go is compatible with video recorders, camcorders, games consoles and a slew of other devices, and for folks living in the UK, you will be pleased to know that it can transfer Sky+ recordings or convert DVDs into iPhone-friendly MP4s. Now how about that?